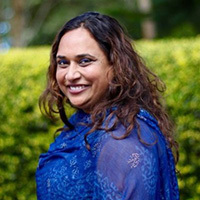 Rajasvini Bhansali is the Executive Director of International Development Exchange (IDEX) and a passionate advocate for participatory grassroots-led social change and movement building. In a wide-ranging career devoted to social, ecological, and economic justice, she has led a national social enterprise, managed a public telecommunications infrastructure fund addressing digital divide issues and worked as a researcher, planner, policy analyst and strategy consultant. Vini also worked alongside community leaders as a capacity builder for youth polytechnics in rural Kenya for over two years, an experience she credits as motivating her to work to transform international development and philanthropy towards more people-centered practices. Born and raised in India, Vini earned a Master′s in Public Affairs (MPA) with a focus on technology and telecommunications policy from the LBJ School of Public Affairs at the University of Texas at Austin and Bachelor′s degrees in Astrophysics and Interdisciplinary Studies in Humanities & Social Sciences from UC Berkeley. Vini has been involved in community organizing and volunteer board roles for the last two decades. Currently, she serves on advisory boards for the Agroecology Fund and the Women’s Building in New York City. Vini guest lectures in the Master’s Program in Ecological Sustainability at the University of Vermont and she also served as a Social Entrepreneurship (SEERS) fellow at Stanford University in 2016. In 2015, she was honored with a Leaders in Action award by Asian Americans/Pacific Islanders in Philanthropy (AAPIP). Vini is also a published poet, essayist, storyteller, popular educator and a trainer with the Rockwood Leadership Institute. When not engaged with community organizations, Vini can be found hiking, cooking and dancing with friends.